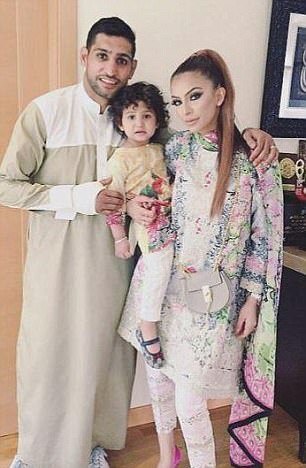 Home News Death threat sent to Amir Khan for 'betraying' Islam after posting a photo of a Christmas tree in his home to his 1.2m Instagram followers. Death threat sent to Amir Khan for 'betraying' Islam after posting a photo of a Christmas tree in his home to his 1.2m Instagram followers. Amir Khan was bombarded by threats and trolling messages after he posted a picture of his Christmas tree online. The former boxer, who is a practising Muslim, posted a photo of the tree on yesterday night, saying his three-year-old daughter would like it when she woke up. But the post led to a horrific backlash from some his followers, who posted abusive and threatening messages in response. Some accused Khan of 'betraying' Islam, while another told Khan he should 'go to hell' for putting up the tree. In an interview last year, Bolton-born Khan said he spends every Friday afternoon at the mosque near his training camp in California. He said the mosque was his 'favorite place to go', adding: 'I am not afraid of saying I am a Muslim. 'I think some people would be scared to say that they are Muslim, especially during the current time, but I am a proud Muslim. Khan was reportedly allowed separate meals from other contestants on I'm A Celebrity... Get Me Out Of Here!, to make sure everything he ate was halal.